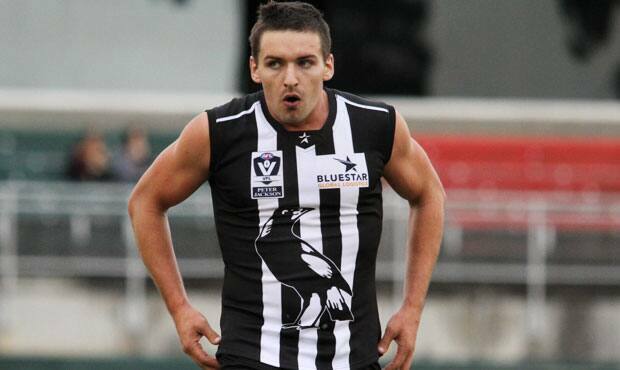 Cathal Corr kicked four of Collingwood's six goals in its VFL practice match against the Northern Blues on Friday. Collingwood's VFL team was handed a lesson in consistency by the Northern Blues during its 41-point loss at Princes Park in a practice match on Friday evening. With only one goal to half time and a total of six for the match, the Magpies never truly gave themselves the opportunity to pinch their first win of the pre-season. But a four goal to two third quarter (three of which were scored in the first five minutes of the third term) showed exactly what the 2013 version of the VFL Magpies are capable of and is what left stand-in coach Anthony Rocca both heartened and frustrated. "I'm a little bit disappointed with the result, particularly early," Rocca told collingwoodfc.com.au after the match. "I thought we were second to the ball a bit. Their midfield was harder than us early, moved the ball quicker than us. They were cleaner than us early. "Our third quarter was a lot better, we moved the ball a whole lot better. We were first in and got the ball out and created some really good passages of play in the third quarter. We've just got to maintain it for the whole game. They're a good outfit. "We'll get some AFL quality back next week and take it from there." Coming into the match with four AFL-listed players to the Blues' eight, Collingwood let the home side off the leash late in the first quarter when it piled on four goals in a hurry to establish a 24-point advantage at the first break. It took until the third quarter before the Magpies awoke. Two goals to full forward Cathal Corr were followed by a strong mark and goal from Tim Allan and suddenly the Pies were back within 13-points and playing with all the momentum. Two late goals to the Keenan Posar and Jarryd Cachia steadied the Northern Blues ship and guided it to a 28-point lead at three quarter time. From there, the floodgates opened (as far as a March practice match is concerned) as the Blues rounded out the match with five of the last six goals to record a convincing 41-point win. Rocca was pleased with the performance of teenage draftee Ben Kennedy who held his own in the centre square against players the ilk of Heath Scotland, Tom Bell and Cachia. "Kennedy was OK. He had some really good contested efforts against some Carlton players. He had some good penetrating kicks inside 50 which was good." Young forward Jackson Paine came off second best after a clash of heads with a Blues opponent midway through the second quarter. He sat out the rest of the match but Rocca said that he had suffered nothing more than a bout of concussion. The VFL team will play one final practice match before beginning its home and away season against North Ballarat at Victoria Park on 6 April. But it's not a run of the mill practice match. It's the curtain raiser to the semi-traditional Carlton v Richmond game at the MCG next Thursday evening which is scheduled to start at 4.20pm. Rocca and his VFL coaching staff are buoyed by the prospect of leading a side containing several players with senior experience. "All of our guys who aren't playing in the AFL squad will be right to play against the AIS on Thursday. We're probably looking to get a few back. "Possibly we'll get 'Daisy' (Dale Thomas). I'm not sure about 'Bally' (Luke Ball)' so we'll just have to wait throughout the week to see how we go." 1. Kane Lambert, 2. Adam Marcon, 3. Andre Gianfagna, 5. Tim Lincoln, 8. Brant Bransgrove, 9. Anthony Bonaddio, 10. Tim Totevski, 11. Tom Temay, 12, Heath Scotland, 15. Paul DiRago, 22. Keenan Posar, 23. Tom Wilson, 27. Nick Meese, 28. Troy Menzel, 29. Aiden Yelland, 36. Jaryd Cachia, 39. Tom Bell, 40. Dean Soncin, 44. Nathan Valladares, 47. Luke Visser, 51. Ed Curnow, 53. Declan Foott, 57. Frazer Dale, 64. Josh Burgess, 66. Bradyn Taglieri, 80. Robert Warnock, 82. Tim Currie.